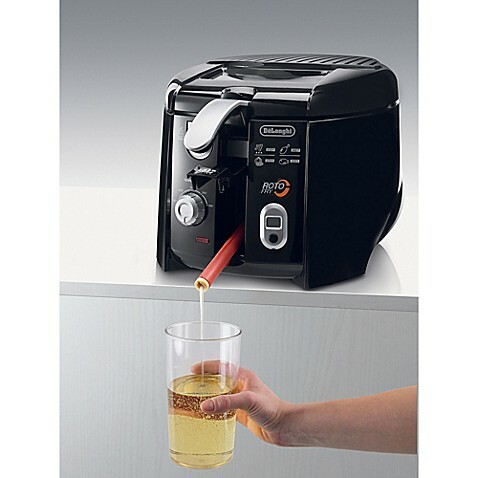 Enjoy crispier and tastier food with the De’Longhi 2.2 lb Roto Deep Fryer. You can save on oil consumption and fry healthier by using half the oil of traditional fryers with the tilted rotating basket, which also achieves crispier results every time. If messy, hot oil cleanup scares you away from using deep fryers, the patented easy clean oil draining system will help combat your fear. Simply pull out the hose stored in the front of the fryer and drain the oil into the included collecting container. Non-stick interior and dual filtration with included replacement filters also help with the easy cleanup and lingering odor protection. You can check the frying progress without having to dodge splattering oil with the windowed lid and outer cool touch handle. Other highlights include removable digital timer and easy-to-use adjustable thermostat. Achieve crispier and healthier results with half the oil usage by using this powerful and stylish deep fryer. With a patented rotating basket and dual filters, this deep fryer makes it possible to cook your favorite fried foods with ease. New patented integrated Easy Clean System for oil draining with exclusive oil-collecting container for easy filtering and preservation of oil. Exclusive oil-collecting container for easy filtering and preservation of oil. Cool-touch walls thanks to air circulating between internal bowl and external walls. Special accessory supplied to eliminate any particles which may collect in the oil drain tube. 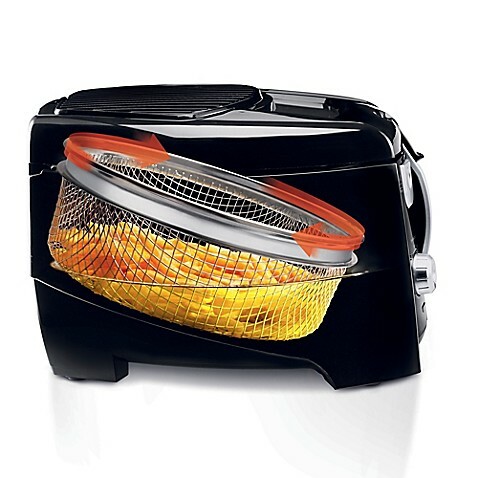 Frying basket can be raised or lowered when lid is closed. Rubber lid seal. Automatic lid release button. Lid can be removed and washed. Adjustable thermostat from 150 to 190 C.
2 replaceable anti-odour and anti-vapour filters. Special accessory to remove possible residue from the """"Easy Clean System"""". 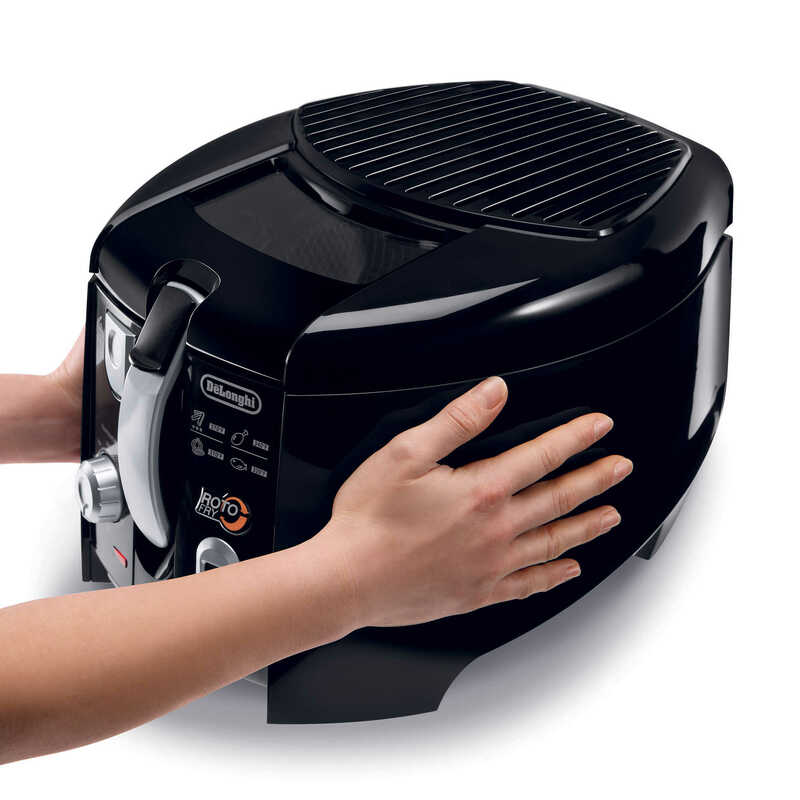 Non-stick interior means the fryer can be quickly cleaned with a sponge. Digital timer ringing when food is ready.